← Pop Tart Ice Cream Sandwiches and our family debate! 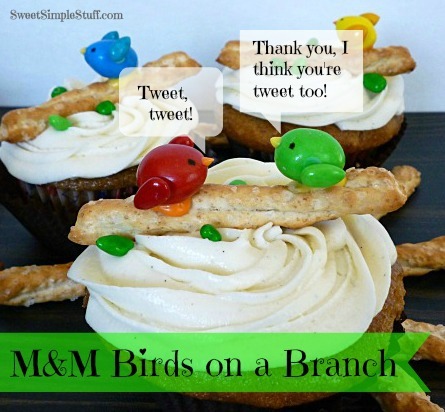 Today, I made birds sitting on a branch … for you! 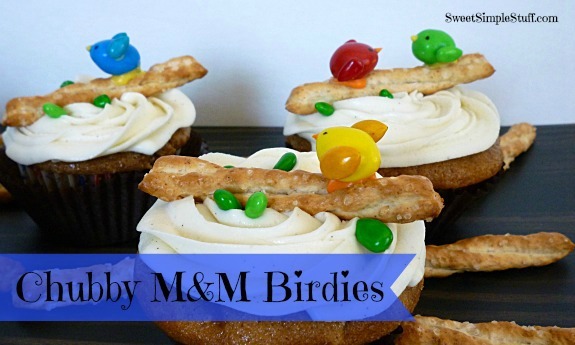 These little candy birds have been in my mind ever since I made the M&M Chicks and Sugar Swings made Birds on a Wire! When I made the chicks, I couldn’t decide if the chicks should have wings … I asked for opinions … and you gave opinions! These chubby little birdies have wings! Some projects are more fun than others … this was definitely a fun one! I smiled the whole time while I was making these birds! They remind me of tiny little toys … I want to play with them, hold them, talk to them … the hubby ate them without a second thought! Work on a tray lined with wax paper or parchment. Melt colored candy coating. Lay pretzel flat side down and place a small amount of melted yellow/orange candy on top of pretzel … this will be the bird’s feet. Place an M&M on top of the “feet” and hold until set. I tried to place the M&M so that the white “M” was not showing. Use a tiny amount of melted candy to attach sunflower seeds to the sides of the M&M (hold until set) … creating wings. Use the black marker to make dot eyes and yellow/orange melted candy to make a beak. 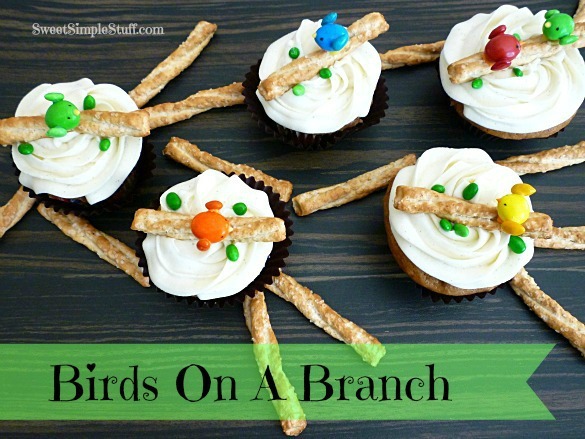 Maybe you even want to make a couple of birds on a branch! Remember to stop by tomorrow for the spice cake recipe! How adorable. Just as cute as can be. When I first seen the picture of the little birds reminded me of those little wind-up toys that go hopping across the floor. 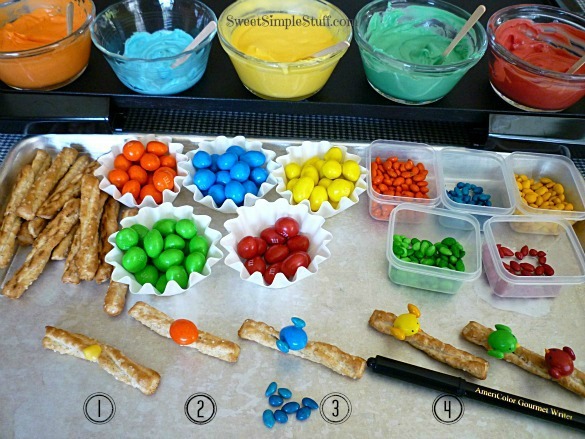 One problem making birds or anything out of m&m’s………….I would end up eating more m&m’s than making birds. Thank you Colleen! Since you brought up the wind up toys … they not only look similar, but the candy birds will fall on their sides, just like the toys would, heehee 🙂 In regards to the possession of M&M’s … it’s one of my struggles too … they are hard to resist. They are SO chirping cute!!! Thank you … CLEVER Karene! total genius! I love it! Brenda, I think the candy-coated sunflower seeds for wings are brilliant. I love these!! and such cute little birdies with the wings! thanks so much for linking to the birds on a wire, something about cute birds right?? I am ready for spring! Thank you Michelle 🙂 I agree … there’s something about cute birds!